The Mini Mes weren't very well at the weekend unfortunately so all plans were cancelled and our time was spent indoors instead under duvets and resting. 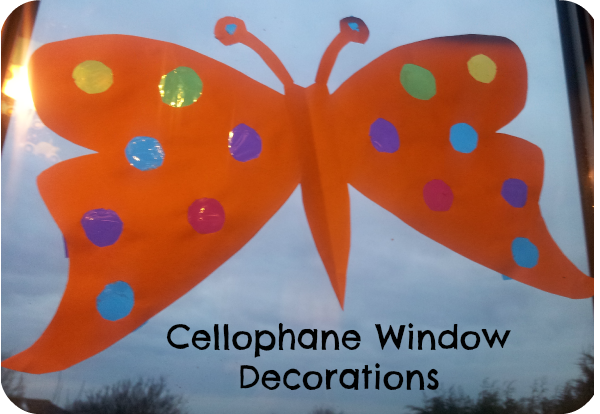 We did however get to make some rather pretty butterfly window decorations which are quick and easy to do with only a few materials required. They are ideal for Spring, teaching about symmetry and colour. You will need card, different coloured pieces cellophane, scissors, glue and a pencil. Fold the card in half and with the pencil draw half a butterfly coming from the fold with some circles/patterns on. Using the glue attach pieces of cellophane over the holes, turn it over once complete and then place in your window for the light to shine through into your room. How pretty! Must give it a try! Thanks, beautiful and doesn't look too hard. We'll look out for the cellaphane. Very pretty - Little A would love making one of these! Oh what a lovely idea - would love you to link this up with the Spring Carnival please. What a great idea - brilliant for getting the little ones making and creating!